Your Year to Create Love - Goddess T.O.U.C.H. Awakening to your higher consciousness. All you ever wanted to know about YOUR SOULMATE. 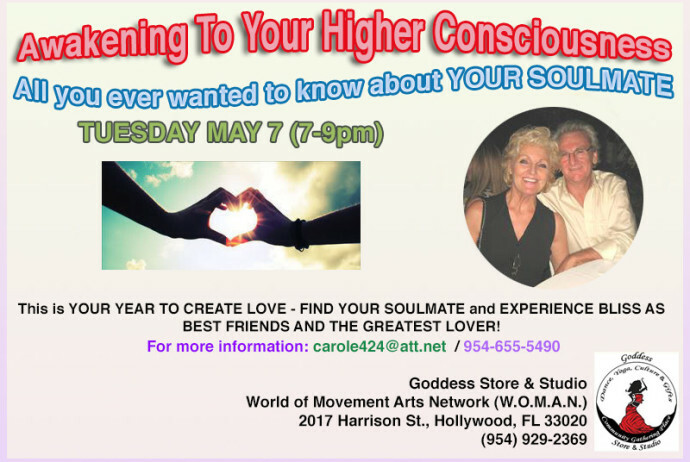 This is YOUR YEAR TO CREATE LOVE – FIND YOUR SOULMATE and EXPERIENCE BLISS AS BEST FRIENDS AND THE GREATEST LOVER! I did it and i’ll show you how you can too! I will share with you how to “Shift” your state of mind and begin creating what you want. I will take you on a journey (a brief guided meditation) to a new place to access the special tools you will need. Also, I will help you to energetically clear and balance your energies (limiting beliefs/programming/issues/etc.) as we go. Do you feel stuck? Stressed? Lonely? Sick and Tired? Where is the love of your life? Bring any and all questions you may have. Time for Q & A afterwards. Private consultation available. Rev. Carole Aileo Ha’la Ramsay, RMT, AP, is experiencing her first Full Conscious incarnation as a Divine Being in a Human form in this time/space/dimension. Rev. Carole has learned to function in this 3D density as an exec in the corporate world. She also comfortably can see, hear, feel and be with Spirit, other realms/dimensions/the deceased, simultaneously. Communication is her forte and her gift to the world. Carole is the founder and President of GODDESS T.O.U.C.H., INC.